What a year 2017 was! Wildfires in the west destroyed fabled wineries and seared neighborhood after neighborhood. Powerful earthquakes toppled homes and tall buildings alike, snuffing out innocent lives. As if these weren’t enough, there was the overwhelming spate of tropical hurricanes that ravaged Texas, Florida, and Puerto Rico leaving stunned victims with nothing left but the clothes in their backs. It’s hard to envision how to help victims recover from such unimaginable and heartbreaking disasters. How do they put their lives back together when everything they owned lies broken and soggy at the curb? This is where someone like our neighbor Barbara Breitman comes in. She has been a volunteer for the American Red Cross since 1971, and her background in psychotherapy is a valuable asset. Additionally, many volunteer jobs require constant updating because they address health emergencies. So, the Red Cross trains its volunteers in their recommended courses. Dealing with the Sylmar earthquake victims was Barbara’s first experience in the field. Before moving to SCSH, she lived and practiced in west LA for almost 50 years. Barbara was involved with the Red Cross to provide support and hope to the victims of the 2013 LAX shooting that took a TSA agent’s life and the shocking 2014 school bus crash when 10 high school students traveling to Humboldt College for a college preview tour were killed. During that time, Barbara also coached Special Olympics and supported the Red Cross by coordinating registration for fundraisers and the organization’s Annual Red Tie Affair. But it’s the hands-on disaster relief that truly grabbed her heart. Barbara recalls that something as simple as bringing food and water to those stranded in the LAX shooting, and just being there to listen to them, were so important. After a time, Barbara stepped back a bit and became more involved in her practice. But when she recently moved here to the desert and cut back her work hours, she got more involved again. In September 2017, Barbara was deployed to Texas to help with Hurricane Harvey relief. I asked her what it was like. It’s quite a story. First, she had to be “vetted” and thoroughly checked out health-wise to be sure she could deal with the challenging after-effects and physical conditions of a disaster like Harvey. She was surprised that she turned out to be one of the oldest volunteers. Barbara was also given a list of personal things to bring. You see, the living conditions — while clean and organized — were going to be very basic. She was given updated Red Cross training to prepare for her deployment. Barbara arrived in Beaumont, Texas, three weeks after Harvey struck. Luckily by then, the water was subsiding, but the streets were still lined with the victims’ belongings. She recalls you could see the high waterline on buildings and houses. Waterlogged cars remained abandoned in the medians, and piles of ruined furniture and household debris clogged most of the neighborhoods. Like many of the volunteers, Barbara was housed in a large warehouse-type shelter. A narrow army-style cot and the mess hall canteen were the only comforts of home for her 10 days there. Remarkably, the teams served about 4,000 meals a day to the victims. In spite of everything, the volunteers and Red Cross shelter staff made it cozy. The warehouse also housed a massive amount of relief supplies such as food, water, diapers, formula, and health and household needs distributed to victims. A typical 12 to 14-hour day started with early morning staff meetings, where daily work assignments were passed out. The teams would then stock their mobile units and go out into the community. Barbara usually traveled in a team of three: one nurse and two mental health workers. They drove a van or car that held food, water, and a variety of household supplies plus personal care items. Beyond giving out these supplies, the team’s job was to listen and provide support, comfort, and hope — to give a voice to the victims. Barbara admits she was often tired after those long days. But the friendships, camaraderie, and support of other volunteers made every day worthwhile. It didn’t hurt that there were cuddly emotional support dogs, too. 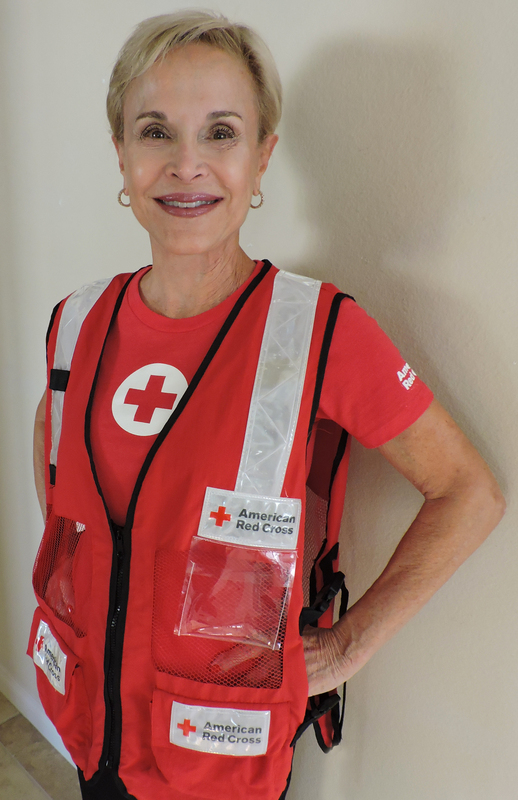 Barbara feels it was the “best experience” she’s had because of the sincere gratitude that victims expressed to the volunteers as well as the support of the Red Cross staff and fellow volunteers. It often brought her to tears. None us wants another disaster to strike, but we can be thankful for selfless volunteers like Barbara Breitman who give so generously of their time and hearts. You can definitely count on them! 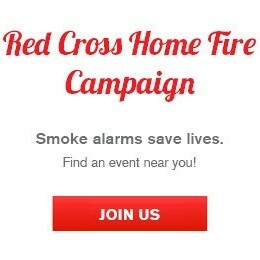 Next Red Cross Orange County is looking for local heroes! Thank you, Barbara, for being there to help those in need!